WASHINGTON — Can we talk? Donald Trump would like to chat. While the Russia investigation still looms and polls still predict major Republican losses in the House in next month's midterm elections, Trump has been logging a series of wins, including appointing a second Supreme Court Justice to the bench and reaching an updated North American trade deal with Canada and Mexico. The stream of negative headlines that has been a constant presence through most of Trump's administration has abated — at least for now. "I think he's having a lot of fun right now," said former campaign adviser Barry Bennett, who pointed to several factors, including Trump's rally-packed schedule, which has put him in front of cheering crowds nearly every night. Plus, "There hasn't been a bad story in over week," Bennett marveled. But that was just the beginning. Trump's day also included an Oval Office interview with New York Magazine, a 15 minute question-and- answer session with reporters on the South Lawn as he departed the White House for a rally in Iowa, and another conversation with reporters aboard Air Force One. On Wednesday, as Hurricane Michael was about to make landfall, Trump began his day with a storm briefing, during which he took questions on topics including a missing Saudi journalist and potential replacements for Haley. He also took questions at a bill signing and after landing in Pennsylvania for another rally, where he said the Federal Reserve had "gone crazy." After his rally — and interviews with the Washington Examiner, Time magazine, a local television station — Trump headed home. 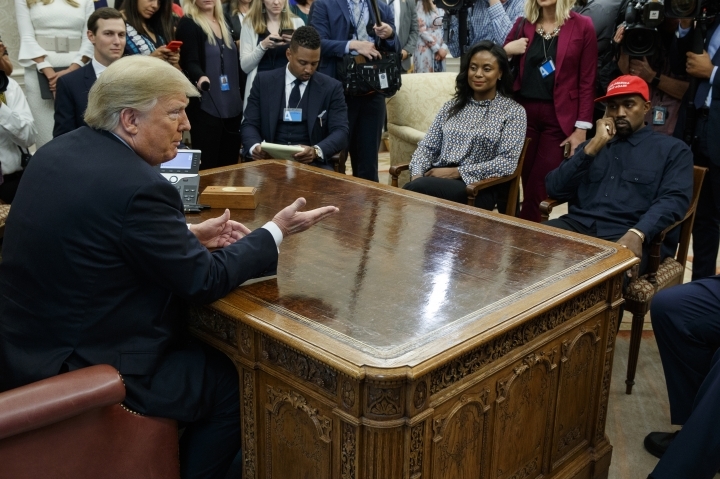 Yet to come: Chatting at two bill signings, including one attended by Kid Rock and other musicians, a forum on drug trafficking, a sit-down interview with CBS's "60 Minutes," which the network had been trying to tape for more than a year, and that epic pre-lunch appearance with Kanye West.